In collaboration with editors John Joseph Adams and Hugh Howey, A Dribble of Ink is proud to introduce a series of interviews with the authors of The End Has Come, the final volume in the The Apocalypse Triptych. Following on The End is Nigh, and The End Is Here, The End Has Come contains 23 stories about life after the apocalypse. Aside from an obsessive drive to gamemaster superhero role-playing games (pen and paper superhero games, like Dungeons and Dragons, except… superheroic), Acts of Creation was my first foray into science-fiction prose – the idea of exploring a universe populated by artists with the potential to crack suns and detonate fleets with the ease of painting with watercolors appealed to me. Not only that, but exploring the idea of how you would attempt to contain and disarm such weapons in the wake of the apocalyptic war they won… in a manner of speaking. I played around with a few other ideas and stories in the universe. Strangely enough, the stories often veered into family and romantic relationships, often with a mentor figure seeking to inspire a disciple with far more potential, sometimes older, sometimes younger, a character set-up I’ve often used in digital role-playing prose as well, from Planescape: Torment, to Knights of the Old Republic II, to New Vegas. I guess I haven’t quite gotten a satisfying answer on it yet, but arguably, each game universe comes with its own interesting twist that makes it fresh again in my eyes. I always carried the hope of being able to share the story one day. And when John Joseph Adams brought up The End Has Come anthology and asked if I wanted to contribute, it seemed a great fit. And it helps that John and Hugh (Howey) are nice folks – Hugh, in fact, writes some of the nicest critiques I’ve ever seen from an editor, he makes sure you know what you’re doing well along with what you need to improve on. Just about anything on the library shelves. And on the comic racks. Note that I grew up in the late 70s, early 80s, so no Kindle, no digital reader. Instead, I’d hop on my bike, ride to the library, load up my backpack with books, and then take my haul home and read in-between episodes of Star Trek: The Next Generation. Among some of the books I loved was Madeline L’Engle’s A Wrinkle in Time and a Wind in the Door (love the last page of that book, it reminded me that you don’t need to spell out everything to make something compelling), the Narnia series, J.R.R. Tolkien (although I couldn’t get into The Silmarillion), and the Chronicles of Thomas Covenant – which had a lot of harsh material for a young reader, but I enjoy Donaldson’s writing, and he’s crafted some of the most memorable epic moments for me in fantasy and sci-fi literature from the opening challenge from Lord Foul to the horror and confrontation with the Amnion in This Day All Gods Die. I also enjoyed Asimov’s Foundation series (I liked the Robot series, but I liked Foundation more because the concept of psychohistory and the idea of the Mule were fascinating), Arthur C. Clarke (Childhood’s End is one of the best books I’ve ever read), Lloyd Alexander’s The Black Cauldron series (The Chronicles of Prydain), Harry Harrison’s Deathworld, almost anything by John Bellairs (esp. The House with a Clock in Its Walls), the Great Brain series by John Dennis Fitzgerald, Xanth and most of Piers Anthony’s novels, Ursula K. Le Guin (Tombs of Atuan grabbed me because of the dungeon aspects and because of its insane map in the front of the book, it reminded me of a D&D adventure, and I went on to read the Earthsea Cycle series and The Left Hand of Darkness), Sheri S. Tepper’s True Game series, and Susan Cooper’s The Dark is Rising series – I actually re-read The Dark is Rising, Deathworld, and A Wrinkle in Time/A Wind in the Door recently for a nostalgia trip and attempting to remember what I enjoyed about reading in the first place. Nowadays, most work and media consumption is largely for work, not for enjoyment, so I had a moment where I realized I had to step back and learn to love prose and comics again. I’m not 100% recovered yet, but I’m getting there. As for comics, I was a big fan of the X-Men, which felt like a strangely “realistic” cutting edge comic (super-powered discrimination based on a twist on one’s genetics was new at the time, and the X-Men were beginning to branch out from John Byrne/Claremont’s run with Days of Future Past, which finally became a movie). Also, I was still in early high school when Alan Moore’s Watchmen hit, and that really stirred things up for an otherwise tired genre. Other favorites included: 2000 A.D., The Flash, Suicide Squad, Frank Miller’s run on The Dark Knight and Daredevil (Born Again was amazing), Simonson’s run on Fantastic Four… and what’s been interesting to me is how much of these older stories the current run of Marvel movies have returned to source those old plots and intrigues, which is proof to me those authors knew what they were doing, and they really captured the imagination and essence of the characters. I also went through reading lots of game modules for Dungeons and Dragons and other favorite games, only because when I read them, I felt like I was exploring the dungeons myself and having adventures, since, uh, “gathering a party to venture forth” was almost impossible – until computer games came along, and suddenly I had my own digital game master (starting with Bard’s Tale 2 and going onwards). I will say the opportunity to contribute stories now has been gratifying. I finally feel I can give back to the prose community for all the good times they’ve given me (including inspiration and cool ideas and everything else a designer could ask for). You’re probably most well-known for your award winning video game design, and comic book writing. How do those mediums feed into your prose? They have the capacity to help and hurt the writing process. As an example, when doing video game design, you can explore almost every permutation of a character you feel find interesting to delve into – with standard prose and comics, you need to make the best choice you can, and when you’ve trained yourself to do equal branching, it can be hard to “trim” those branches and focus the best arc for the piece. Comic books have also been a bit different in a (helpful) way – they’ve trained me to think visually to tell the stories, which is an important skill in game design. Storyboarding, camera angles and how they can communicate the power and emotion in a scene, dialogue brevity, and layout of pages and panels to emphasize action, contemplation, and building tension have all proven useful. What I like about Obsidian and inXile is that a number of the designers eagerly explore variations of prose, not just game writing – Carrie Patel (The Buried Life), Colin McComb (the Oathbreaker series), Nathan Long (Jane Carver of Waar), Adam Heine (his Tides of Numenera novel is excellent), and Andrew Rowe (Forging Divinity) are only a few of the folks I’ve worked with who also write prose in their off-hours, and (no humility here, it’s the truth, especially Adam), they write far better than I do. I feel like I’m stumbling a lot of the time, but hey, I like to believe I make enough mistakes and learn from them to make fewer and fewer errors as time goes on. Or not. It’s up to the reader to judge. You have a lot of experience writing about the end of things – the many Fallout games, Wasteland 2, now this anthology. Is it a coincidence, or are you intrigued by the possibilities post the apocalypse? Intrigued in the sense of enjoying taking aspects of the real world and giving them a hardy shake, yes, and each apocalyptic/post-apocalyptic genre allows for a different spin on the themes, which is welcome. Fallout 2, for example, had a lot of interesting societal and cultural changes that occurred in the wastes (return of slavery, classism, drug-induced work force/towns, overt mob politics, and more, that made you question those institutions not just in the game, but their origins in the real world), New Vegas allowed for commentary on much of the same, and for Wasteland 2, the idea that the world stopped around the 80s (well, technically 90s, but since the game came out in the 80s, I set my franchise clock by the attitudes at the time) allowed me to go back and dig through my childhood for visual and thematic signposts at the time, which I rarely get to do – I felt like I was time traveling, and I was loving it. Finally, what have you got coming up next? A lot. Tons. Maybe several tons. So: The Wasteland 2 novel, an Eternity novella for the backers of our Eternity Kickstarter, leading the creative aspects for a new game at Obsidian, work on inXile’s Torment: Tides of Numenera, and even a few more short stories here and there. These short works of prose provide a great outlet for exploring an idea that’s been buzzing around in my head and running with it until the tiny inspiration demons get worn out and go to sleep, making room for the next idea. Among these short stories is a Forgotten Realms short story set in the world of Icewind Dale, courtesy of Wizards, and also John Joseph Adams invited me to contribute to one of his other anthologies focused on video games, called Press Start to Play, which I had a blast with. I’m grateful for the opportunity, and hope I have the chance to contribute more. 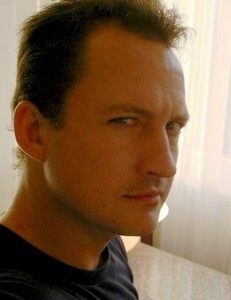 Chris Avellone is the Creative Director of Obsidian Entertainment. He started his career at Interplay’s Black Isle Studios division, and he’s worked on a whole menagerie of RPGs throughout his career including Planescape: Torment, Fallout 2, the Icewind Dale series, Dark Alliance, Knights of the Old Republic II, Neverwinter Nights 2, Mask of the Betrayer, Alpha Protocol, Fallout: New Vegas, FNVDLC: Dead Money, Old World Blues, and Lonesome Road. He just finished working on inXile’s Wasteland 2, the Legend of Grimrock movie treatment, and the FTL: Advanced Edition and is currently doing joint work on Obsidian’s Kickstarter RPG: Pillars of Eternity and inXile’s Torment: Tides of Numenera. 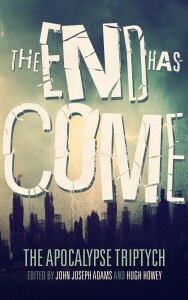 The End Has Come is available as a trade paperback or eBook.